Twist&Shout is a tangible intervention designed to help reduce feelings of stress and anxiety. 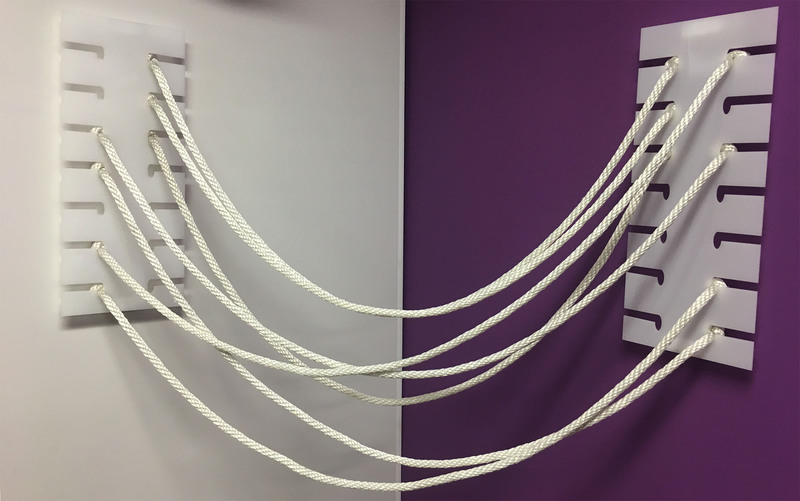 By tangling and untangling a set of anchored ropes in a variety of ways, we encourage users to vent their stress, resolve it, or just keep busy in a shared space. The project mostly relies on the theory of embodied cognition. According to the theory, physical experiences can influence the way we perceive the world. By creating a physical intervention, we set out to influence users’ feelings of stress and anxiety—untangling string could be a metaphor for resolving negative inner emotions. An additional theory on which this project heavily leaned on is the theory of catharsis, that suggests expressing and “venting” negative emotions can be beneficial for one’s emotional state. Twist allows to do so by tangling string. Finally, social support is also known to reduce stress. Creating a collaborative environment that also generates a sense of identification with others could further help relieve anxiety. We started with a simple paper and string prototype. We then tested it by asking users to tangle, untangle and brain the strings, alone and collaboratively. We found that action users did served different function—while the tangling felt cathartic, untangling generated a clear goal and feelings of resolution. We set out to create a soothing tactile interaction—easy and pleasant. This is why our next prototype focused on scale, material and interaction. 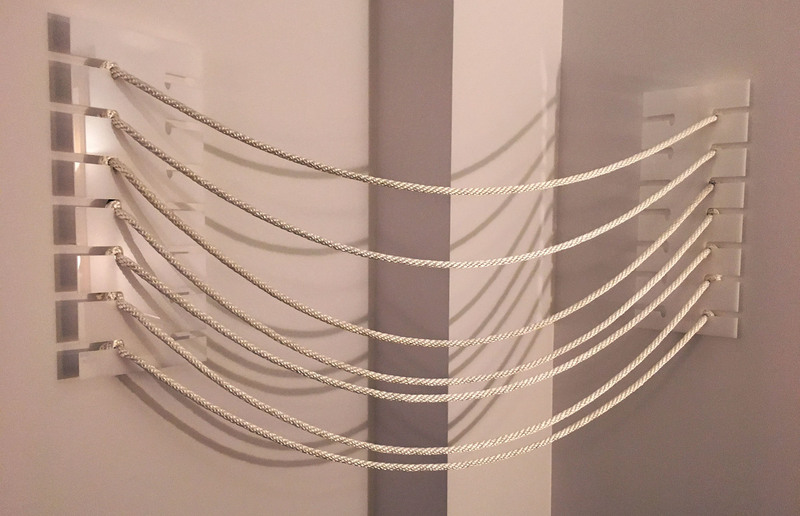 We generated a large prototype with bigger wall-bases and silky ropes. The bases included anchoring slots to easily slide the ropes in and out in the tangling or untangling process. This prototype succeeded in the goal of making the interaction more playful, flexible and physical. Users enjoyed the scale and the material of the ropes. 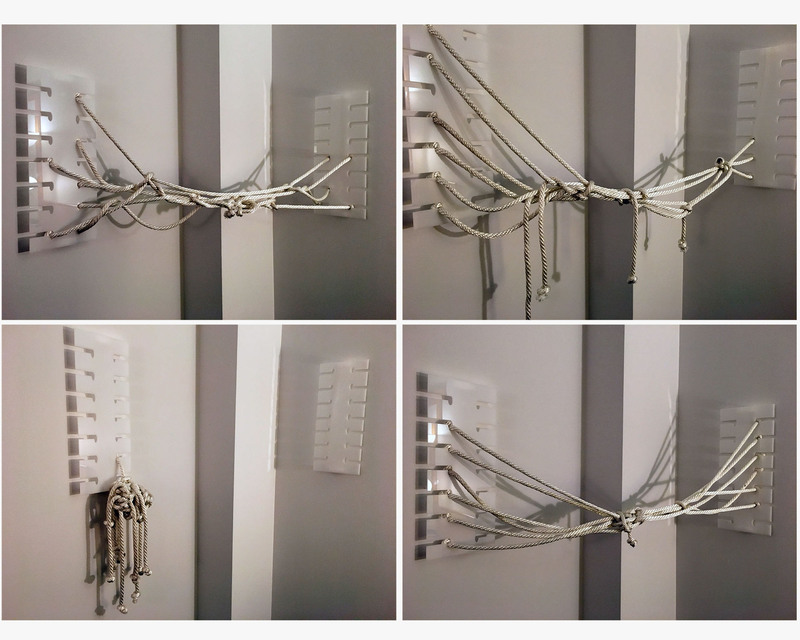 Like in the first prototype, users liked the cathartic feeling that the tangling created, while untangling served as a way to resolve their tense feelings. The next step in this project is creating an even larger and more playful prototype, like a playground to collaboratively release anxiety. We are also interested in the patterns that people generate in such a prototype. From our testings, users took different approaches, generates various outcomes and were influenced accordingly. Finally, we are considering adding sensors to detect stress in the moment and have that influence the large-scale prototype and the overall interaction.